I've lived in London for nearly 17 years and in that time have covered most of zone 2, before settling in West/North West ish London a few years ago, which I love. However, last night's visit to Linden Stores, a family run wine shop and restaurant in Highbury, had me wishing I still lived in North East London. Linden Stores is my actual dream neighbourhood restaurant come true. The kind of place I pine for in my own neighbourhood. A wine shop, where you can sample wines before you buy them by buying a glass of any of their wines for a fiver, that also does small plates of wonderful, very affordable, modern European food and has a buzzing atmosphere despite having less than 20 covers. We were the first table to arrive at Linden Stores so chose to sit at one in the window and watch the world go by and the rain hammer down. The wine list is varied and interesting and I ordered a glass of Tremendous - a white Rioja. Alex had a glass of Laventure - also a white Rioja, both made from the Viura grape, but each with distinct characteristics. The Laventure won for both of us, but not by much as both were bright, zesty white wines with strong soft white fruit flavours. I love a white Rioja and I think I've got it on my brain at the moment as I'm writing the menu for a pop up I'm doing with Campo Viejo (the well known wine brand from Rioja) in October. Food wise, we sampled most of the menu, starting with pork scratchings and apple puree. The thinnest slices of pork skin cut right through to the layers of fat had been deep fried, creating almost crisp like crackling, and served with a sharp and sweet apple puree. For £3. 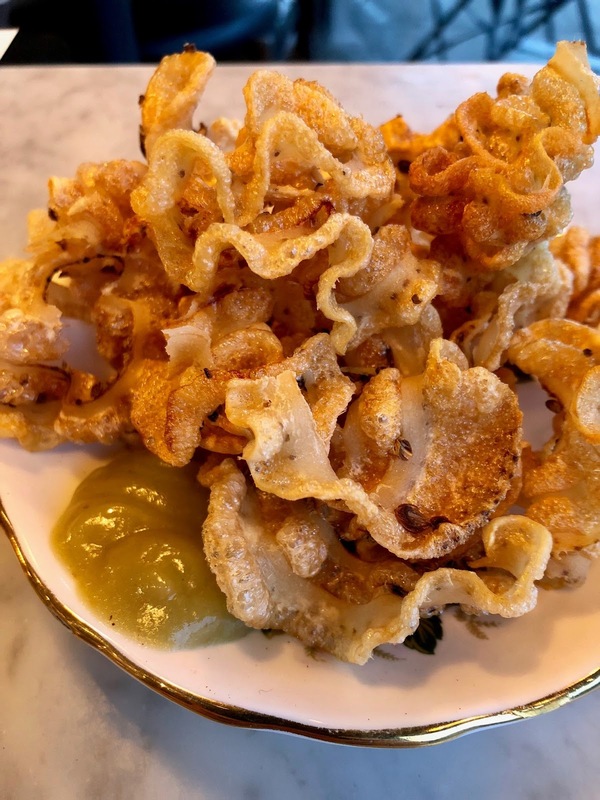 There are gastropubs up and down the country charging £5+ for a "snack" of slightly chewy, often hairy chunks of too salty "pork scratching" so save your teeth, money and waistline and head to Linden Stores for theirs instead. Genuinely the best version of pork scratchings I've tried. And the best value. From one version of perfect to another. Chicken liver pate, crostini and pickled cherry. 3 crostini for £3.... and not even a one bite kind of crostini. A proper plate of snacking food - sweet, rich, gamey, salty and slightly sharp, these were heaven in more than a mouthful. And again, SUCH incredible value. We ordered two rounds and agreed we could have ordered more - they were so good. It seems like such an easy thing to get right, but so many places get it wrong. Other highlights from our meal included pea and Yorkshire fettle croquettes with homemade mint mayonnaise. Light and full of cheese, with a just-so crispy coating, and the mayo made with what tasted like rapeseed oil and lifted just enough but not overpowered by a touch of fresh mint. Home cured bresola had been curing for 12 weeks and was served piled high on a board, and covered with finely grated Quickes Cheddar from Devon (or Quickies according to their menu, a typo I loved! ), garlic crumb for crunch, spring onions and chives for freshness. It was melt in the mouth good and disappeared in seconds. One of my absolute favourite dishes of the evening was the last one to arrive. 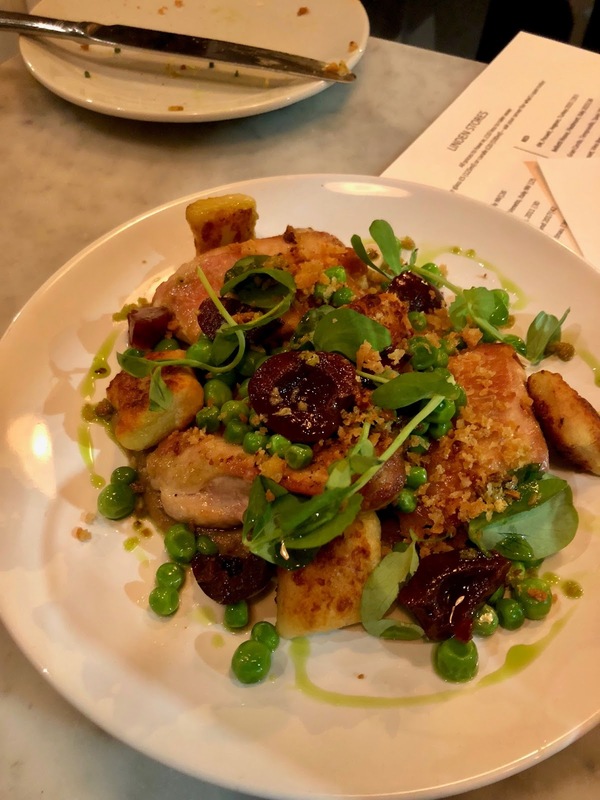 Chicken, smoked aubergine, peas, potato dumplings and cherries (again!) The chicken was perfectly cooked and seasoned, juicy and moreish, and married so well with the other flavours on the plate, and with the glass of smooth, velvety Malbec I had with it. 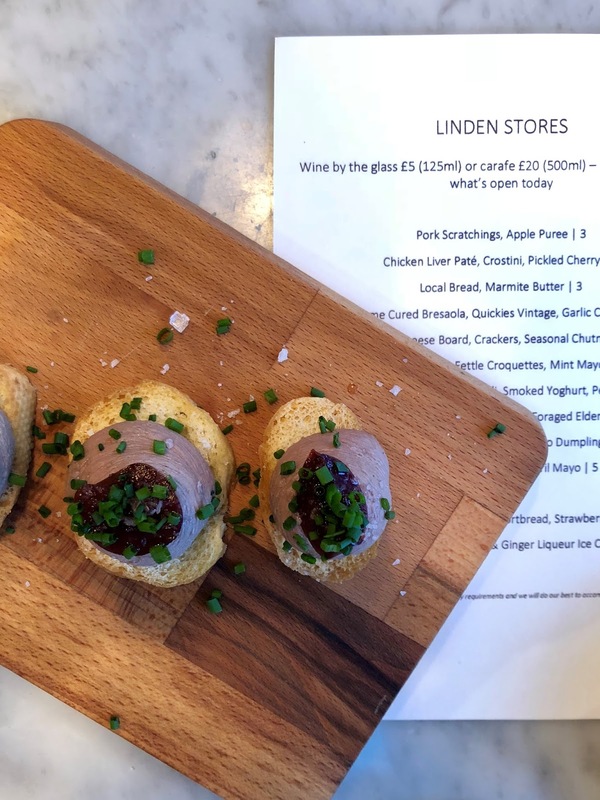 Not only does Linden Stores produce some of the best plates of food I've eaten in a while, it's ridiculously good value - our bill would've come to around £100, but we were kindly invited so the restaurant comped our meal. My favourite thing is being invited to try out a restaurant and already planning our next visit under our own steam before we even leave. 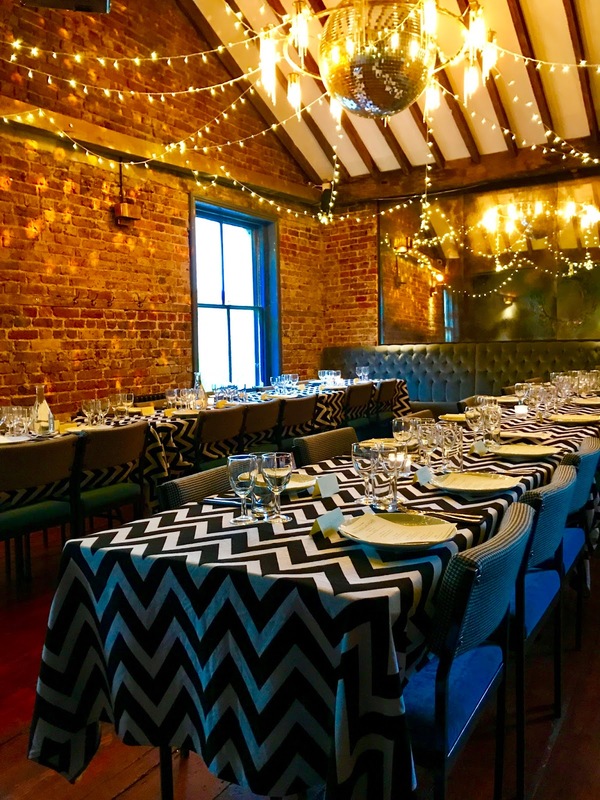 They also have a private dining room downstairs, run wine tastings and classes and other events throughout the months. It's a neighbourhood gem that's well worth travelling for, so I'll be finding my excuses to get back over to Highbury as soon as possible! Wow, it's hard to start blogging again after so long of not doing it! 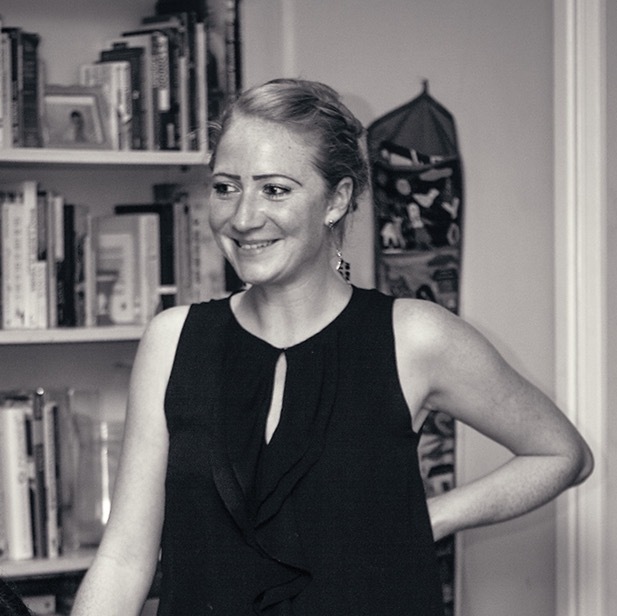 Nothing has changed - I'm still eating at loads of new and delicious places, I'm still doing pop up supper clubs, and I'm still cooking up a storm of new recipes at home - all of which I want to share with you... but somehow, it just hasn't really happened. So here's my attempt to get back on the horse. There's a lot to catch up on, so I'll start from my most recent favourite and work my way back from there! And by recent I mean where I ate last night, and by favourite, I mean Bucket - a new (ish) sustainable seafood place that opened in Westbourne Grove, not far from where I live. I actually first went a few weeks ago during soft launch, on my own. I sat and watched the world go by while eating an oozy, cheesy, creamy, rich lobster and prawn toastie, which was stuffed with seafood, melted cheese and thick bechamel and had been fried in butter before being devoured by me. Sheer decadence, paired with a glass of Provence rose, I knew I'd found my happy place! Last night I went back with Emily. We arrived to what felt like a bit of a sad scene - the beautiful restaurant - think Balaeric beach, done really nicely - was mostly empty and it was 7.45pm. But we took our seats and perused the menu while Emily sampled a chocolate bitters and PX negroni, and I used every bit of will power to order a mocktail (grapefruit juice) in light of my current "cleanse", much to Emily's disappointment. After a good 15 minutes ogling all the things on the menu we finally decided what to eat. 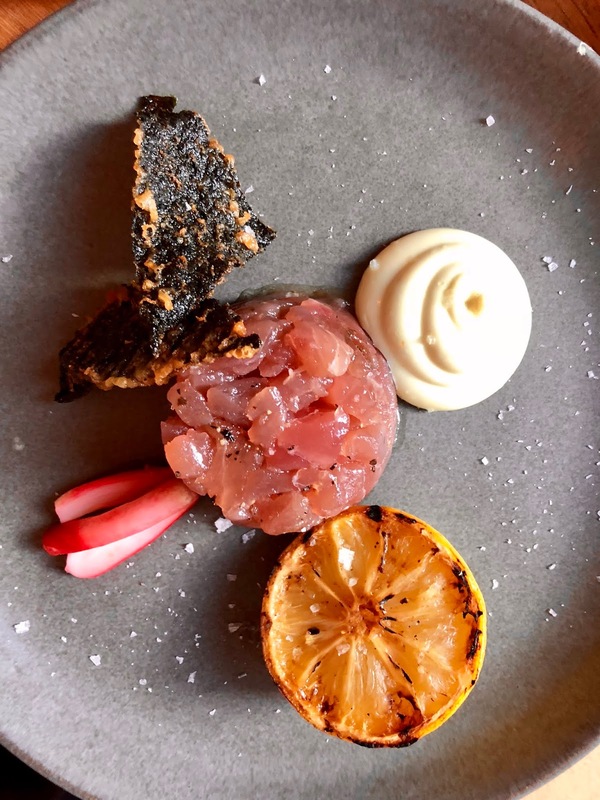 The menu at Bucket is split into small snacks (squid ink crackers, taramasalata, seaweed crisps etc), plates - half of which are virtuous plates of raw or grilled fish, the other half less virtuous, including *that* toastie. Then there are the buckets - various sizes of deep fried seafood, and different flavours of mussels. There's also a boards section offering a half chicken, sirloin of beef or a whole seabass, and plenty of sides to choose from too. As well as weekly specials. By the time we were ready to order we looked around to a much happier sight of a nearly full restaurant. Apparently all walk ins, which says a lot for a restaurant that's on the same road as at least 20 others places to eat. To start we had grilled giant squid steak with lemon puree, and tuna tartare with avocado mayonaisse. I've never had squid steak before, but it was wonderful. 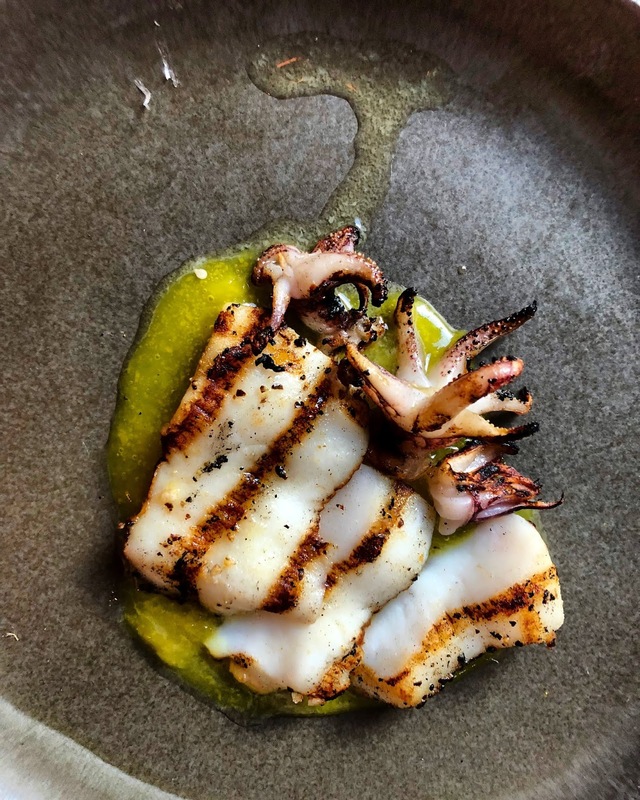 A thick piece of perfectly tender squid, with the smoky char from the grill on a bitter and slightly sharp puree. An absolute must order if you go to Bucket. The tuna tartare was also exquisite. Simply seasoned with salt, pepper and a drizzle of sesame oil, the freshness of the fish shone through. Then it was on to the buckets. 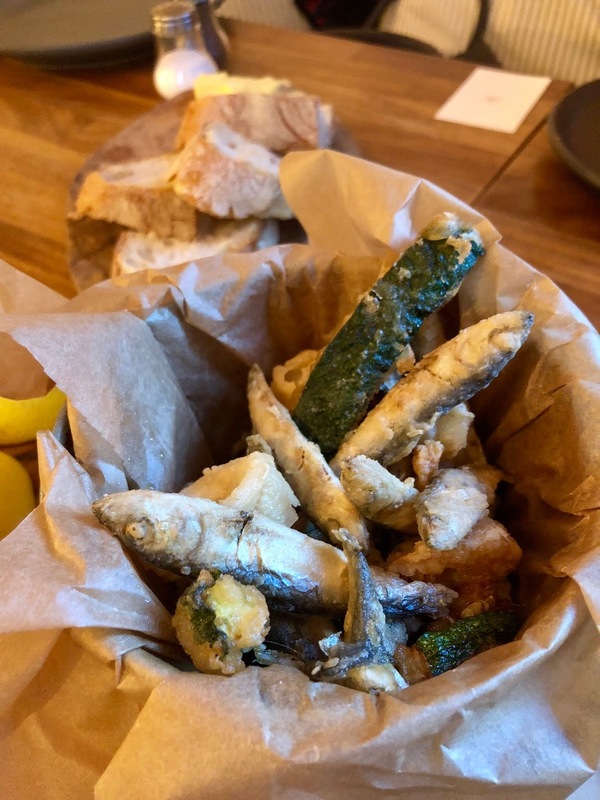 We chose a small fritto misto - whitebait, prawns, calamari and courgette, with all the sauces, and a small bucket of the lobster and brandy mussels. 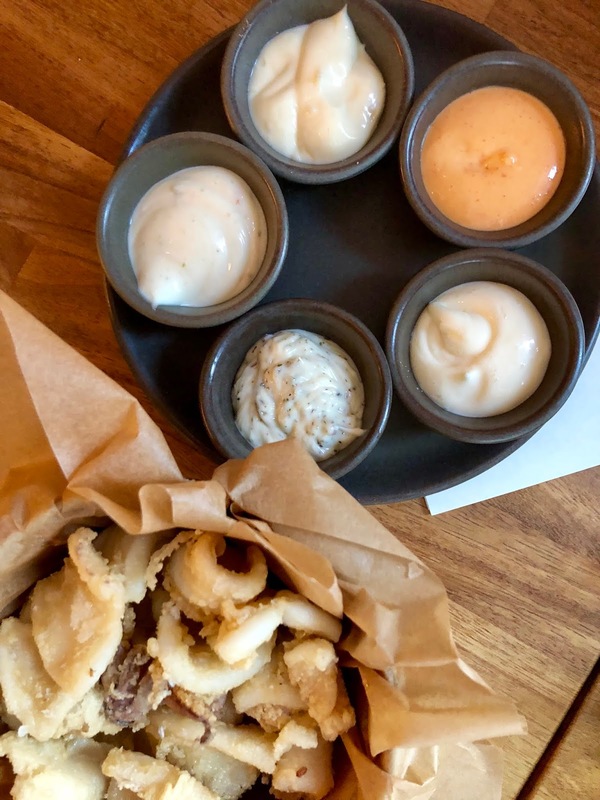 The fritto misto was perfect - the lightest of batters clinging to perfectly cooked seafood - something that's not as easy as it sounds. In order to use sustainably sourced and certificated whitebait, it means using a larger fish than you'll find in 99% of restaurants. This in turn makes the cooking process more difficult, but Bucket have managed to get it just right, with a juicy fish cooked through in a crisp batter. The sauces that we dunked said fish into were brilliant - sriracha mayo was just the right amount of spicy, citrus mayo had lime, lemon and orange zest in it to give it a really full and balanced flavour, roasted garlic aioli was punchy enough to see off all the ghouls, and seaweed mayo had a delicious salty depth to it. Despite devouring all of the fritto misto, it was the mussels that really stole my heart. Again, perfectly cooked in the richest of sauces. It was like an unctuous, reduced down lobster bisque that clung to every mussel in the bucket and begged to be mopped up with the hunks of bread served alongside it. Or even with the charred bits of courgette we'd ordered as a side. Or both. Or just a spoon.... you get my drift! Bucket do three or four other varieties of mussels, none of which I've sampled yet, so I guess I'll just have to go back and work my way through them, and at around £12.50 for a small bucket, that's definitely something I can manage! Emily also tried the lobster mac and cheese, which I'm guessing was the pasta not bread version of *that* toastie, and something I will also need to go back and try for myself. Bucket out did itself. I'd raved about my first visit to Emily, and last night did not disappoint. It's so refreshing to have a reasonably priced, sustainable seafood restaurant in London that serves such tasty and high quality food. As it says on the menu - "there are only so many fish in the sea" and personally, I'm going to eat most of my share at Bucket from now on! Summers - for six glorious months north west London was home to the best food I ate last year. Summers appeared in the tiny upstairs room of the Sir Colin Campbell pub in Kilburn, turning out plates of the finest terrines, meats, pickles, and perfectly cooked vegetables you could ever hope for. Tables were ramshackle, walls were peeling, the whole thing was run by one chef and one waiter, and every time we visited we stayed for hours and hours - drinking delicious bottles of wine, eating as much as humanly possible, dancing downstairs to the Irish "band" before running back upstairs for just one more plate of whatever goodness was on the menu that day. I'm really hoping that Greg and Ruairidh have a secret plan to reincarnate Summers very soon! The Cow - having moved to north west London in late 2016 I've discovered a raft of brilliant eateries right on my doorstep. The Cow is one of those. Probably the most deceptive pub I've eaten in, you'd have no idea of the quality of French food they serve on walking through the doors. An "old man's pub" is the less than flattering phrase one of my friends used to describe it, but appearances mean nothing here. The menu is bursting with fresh seafood, perfect cuts of meat and French classics. The pies are legendary and the chicken liver parfait is the best I've tasted. You can eat downstairs in the main pub, or book upstairs for a more sophisticated experience. Either way, if you're in Portobello/Notting Hill, be sure to head to The Cow for food. Western's Laundry - another neighborhood gem (though sadly not my neighborhood), Western's Laundry, just off Holloway Road, bill themselves as a seafood restaurant, but if you're not a fan don't let that put you off. They're far more than that. 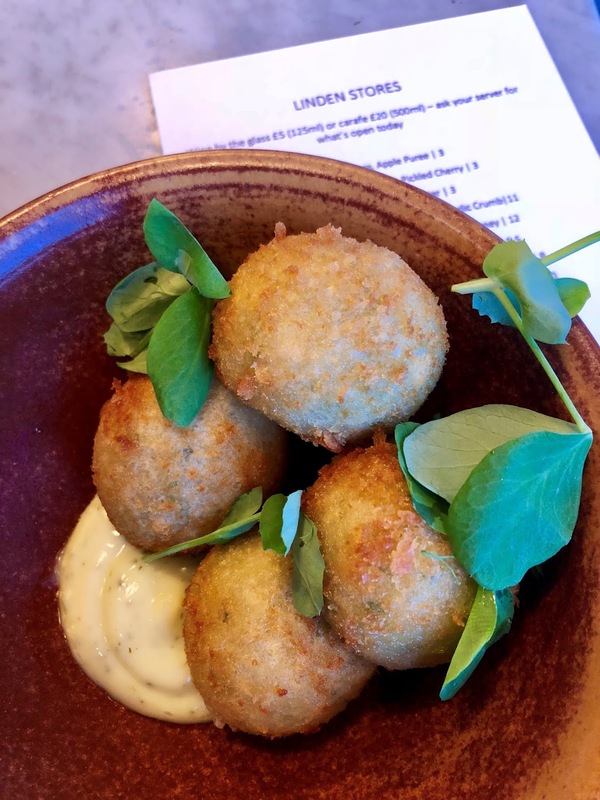 The daily changing menu includes treats like meaty croquettes, delicious cured hams, ray wing with bertolli beans, braised chicken leg and leeks, and seriously good cheeseboards and puddings. Noble Rot - sometimes it takes me a while to catch up. Places go on "the list", I never go, then new places open, the original place slips down "the list" and then a year or two later I finally make it to said restaurant. In this case, Noble Rot, the wine bar/restaurant in Bloomsbury. Having won several accolades for their excellent wine list, this is clearly a place to go for a good bottle. But don't miss out on the food. Pair that good bottle with their extrodinarily good food, go with friends or a date, and don't book anything afterwards - just move yourselves and your bottle from the restaurant to the bar area and congratulate yourselves on picking a corker for an evening of great food and booze. Patty and Bun - there seems to be a lot of "junk food" on my list this year....! Patty and Bun have been a firm favourite of mine ever since I took a bite of their veggie burger at Wilderness a few years ago. The deep fried mushroom dripping in garlic butter won my heart. And then they opened in Notting Hill, and I've been back many, many more times for all of their burgers and sides. Deep fried cheese balls with fiery chilli sauce, thunder thigh chicken bits and their Ari Gold cheeseburger, made with meat from the same butcher I use for my pop ups, with onions, smokey mayo and brioche buns. I figure if you're going to eats burgers, you might as well eat the best quality ones you can get. Dumplings Legend - I'm pretty sure that I became addicted to the Dumplings Legend's dumplings on first bite. I mean, how else can I explain buying 8 or 9 portions of their dumplings that evening we first tried them at Taste. Since that first bite, I've visited their Chinatown base (too) many times. 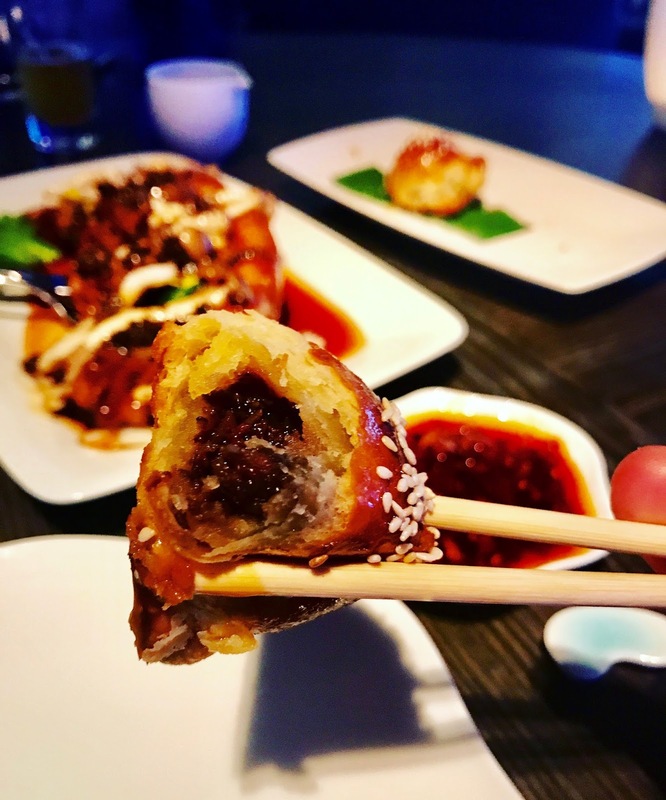 Open till 2am and with an extensive dumpling menu, DL is the perfect spot for your fix of steamed, fried and baked little parcels of joy. Chik'n - another "junk food" place...! But it hardly even counts as junk food.... I think. Chik'n is the first fast food joint from the guys behind Chick n' Sours, a firm favourite of mine, as Chik'n is now too. 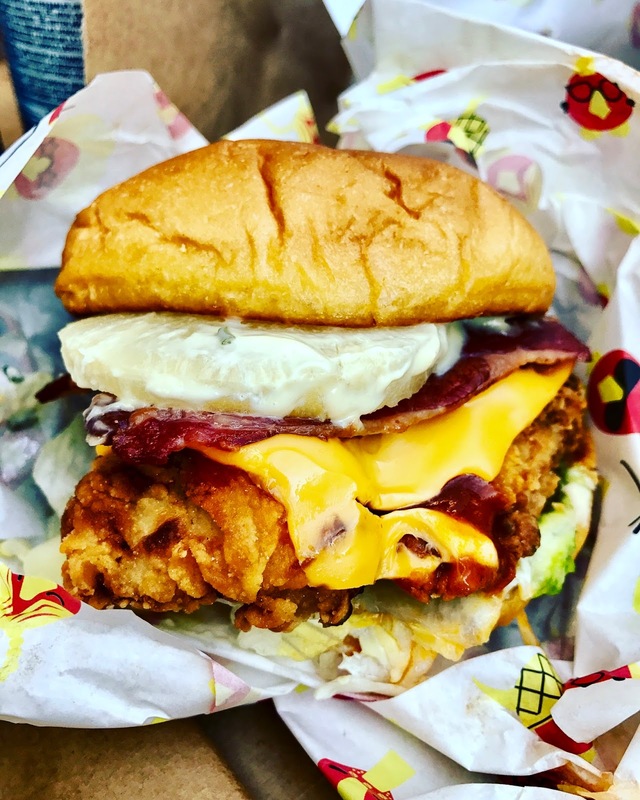 Their first outlet is at the top of Baker Street and serves up buckets of wings, towering burgers and varieties of chicken tenders, all made using higher welfare chicken, which is cooked in rapeseed oil meaning healthy(er) fried chicken. They recycle their waste and dispose of unrecyclables responsibly and are just all round good eggs. Mam - there's no surprise that a dog friendly, Vietnamese BBQ restaurant, run by the loveliest team, that's five minutes walk from my flat makes it on to my top 10 list. But even if you don't live locally (or have a dog) I highly recommend a visit to this gem of a restaurant. With a menu that ranges from crispy chicken wings tossed in fish sauce and crispy garlic, to the lighter prawns with steamed vermicelli and herbs, there's something for everyone in this plant filled, cosy, West London spot. The Wigmore - last but not least (how could I ever put anything to do with Michel Roux Jr last or least?!) The Wigmore is the newish pub that's part of the Langham Hotel near Oxford Circus. 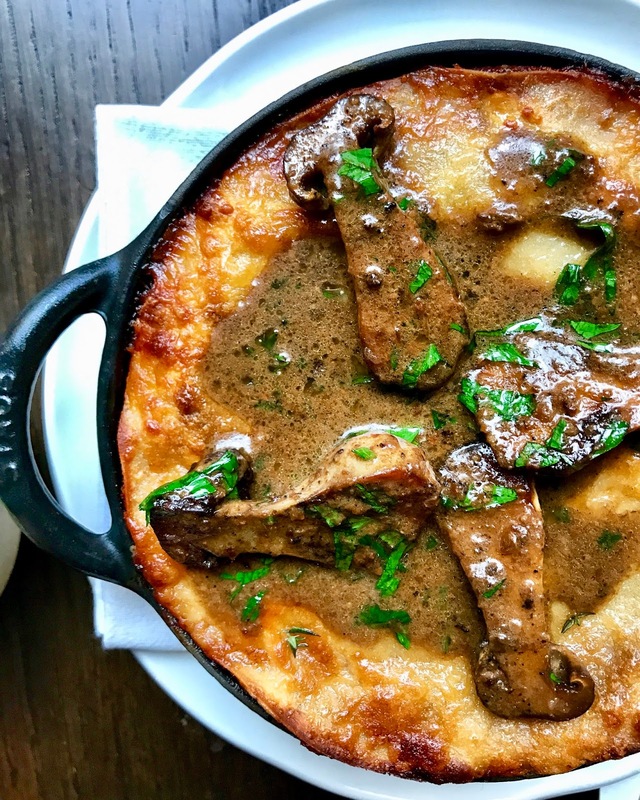 Dog friendly, and so warm and welcoming, this central London pub serves some truly indulgent and delicious food - pub classics done with serious style. We had a rabbit, veal and cep lasagne to share between 2, and today's menu includes toasties, scotch eggs, pies and moules. I can't think of a better place to hide from the madness of Oxford Street and eat all the wonderful things. Without a doubt my favourite Chinese meals in London have been at HKK which has sadly recently closed it's doors. Part of the Hakkasan Group, and with its own Michelin star, it was a smart but friendly and very slick Chinese doing fixed menus to die for. Beautiful plates of food each with their own story and history were paired perfectly with drinks, giving you a meal and a night to remember on every visit. So having shed a little tear about its closing, it was time to find my new favourite Hakkasan restaurant. And when I was invited to check out Yauatcha in Soho, my problems were solved! I'd heard good things, and they too have their own star, so I headed down to Soho, to see if it could live up to my HKK dreams. Yauatcha have two sites in London - Soho and Broadgate Circle in the City. The Soho site is vast. A large, bright open ground floor level, with a slightly darker, moodier cavernous sprawling out downstairs. We sat on the ground floor level and kicked things off with tangy, refreshing mocktail (it was pre Kili and I was on a bit of a cleanse!) Closely followed by plate after plate of incredible food. I'd found my "new" HKK! We started with one of my favorites - the venison puff. I order these whenever I go for dim sum and Yauatcha's were the best I've tried. Light, flaky pastry encased rich, gamey venison meat, so soft it all just melted in the mouth. Dunked in a ludicrous amount of chilli oil I could eat these more often than I should! Whenever I think of dim sum an image of steamed, light dumplings comes to mind, but whenever I get to a dim sum restaurant it's these that are first on the list. The wagyu beef version that Yauatcha do is also excellent - a strong meaty, fatty alternative to the gamey venison. There aren't many dates that get put in my diary months in advance and stay there, no questions asked. 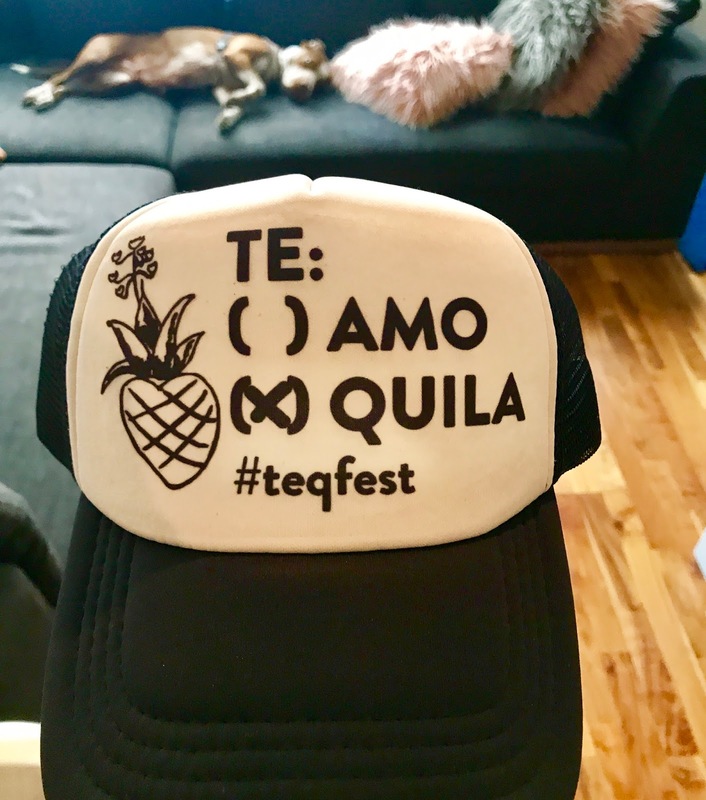 But Tequila and Mezcal Fest 2017 was one such marker penned date. And there's not long to wait for it now. Next weekend - Saturday 7th and Sunday 8th October - sees the festival of my dreams return to London, for two days of Mexico's finest showcased at The Boiler House in the Truman Brewery on Brick Lane. Not only will over 50 of Mexico's top tequila and mezcal producers (including Patron tequila's master distiller - Francisco Alcarez - on his first ever trip to the UK) be on hand to talk you through the production, tasting and pairings of Mexico's very best drink brands, there'll also be food from temper (goat tacos), Barrio (al pastor tacos) and Cafe Pacifico (a selection of pork, beef chorizo and/or veggie tacos), mariachi bands, Mexican art, folklore dancers and even an Aztec ceremony! Whilst sipping on your classic tequila cocktails (Margaritas and Palomas) you can grab yourself a Mexican brunch, or get stuck into a Bloody Maria or Michelada (beer with lime and spices). Adriana Cavita from Peyotito London and Ibiza will be doing demos on how to make the perfect guacamole, and the secret behind Mexican ceviche - 12:45 on Saturday, and there will be talks and seminars on topics like "What the f*ck is mezcal" - 15:15 on Sunday, "How to make the perfect Margarita", and "The tequila masterclass" - 18:00 on Saturday. Saturdays sessions run from 12-4.30pm and 5.30-9.30pm and Sunday's session is 1-7pm. Tickets are £20 and include samples of tequila and mezcal and free entry to seminars and masterclasses. But I reckon the bright idea is to go VIP - for £40 a ticket you get fast track entry (which you'll want if the event's as popular as it was last year), two cocktails, two dishes, samples of tequila and mezcal, and free entry to all the seminars and masterclasses. The currency for the festival is pesos, so get ready to change your money at the door - and a percentage of the proceeds from the festival's ticket sales will be sent to The Cruz Roja Mexicana and TOPOSMX to support the current relief efforts in Mexico following the recent devastating earthquakes. 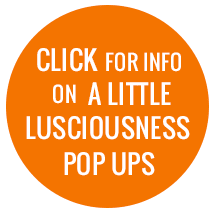 In August last year Lucy and I volunteered to help some friends with a pop up they were doing to raise money for a small charity called Trekstock, who support people in their 20s and 30s who have or have had cancer. Off we headed to Palm 2 in Clapton to spend the day cooking and making cocktails for 60 guests. On the night of the event we met the CEO of Trekstock, and after a couple of glasses of wine (the beginnings of all good decisions) we'd signed up to the 2017 Kilimanjaro challenge. And that was that. A year later, after a mega fundraising effort which included 5am car boot sales, our own huge Hot X BBQ pop up we put on with Hardeep Singh Kohli and Neil Rankin for 60 people on Easter Friday (which we raised £3.5k from alone), and donations from many generous family and friends, the departure date rolled around and off to Tanzania we went. The trip was organized by Trekstock through 360 Expeditions who ran the actual trek itself and arranged everything from the minute we landed at Kilimanjaro airport. Before we left we'd had all the information we needed with regards equipment, training prep and medical requirements. Everything was covered and all our questions answered. So we were good to go. Chick n Sours, in Covent Garden (and originally Stoke Newington) is hands down my favourite place to go for fried chicken in London. Top quality meat from free range, happy chickens is juicy and crunchy and doused in spicy, tangy vinegar based sauces, and served with pickles and watermelon and smacked cucumbers. Heaven. So imagine my joy to find out that the geniuses behind Chick n Sours, Carl and David, had a new trick up their a sleeves. A fast food joint, serving burgers, wings, chips doused in melty cheese, spicy slaws, lettuce covered in blue cheese and all the other delicious bits and bobs, a mere 10 minutes bus ride from my flat..... uh oh! Chik'n is just as I said - fast food, but the very best version of fast food you can possibly imagine. Higher welfare chicken is fried in rapeseed oil (no trans fat and lots of Omega 3 = as healthy as you can get when it comes to deep frying), which is all recycled after being used for frying. In fact, the whole restaurant is run super responsibly, with staff on proper wages, care of duty when sourcing ingredients and getting rid of rubbish, and prices start at £4.95 for the straight up chicken burger (which comes with lettuce, buttermilk and herb mayo, and pickles). And I can't be the only one who thinks these are all good things - there's been a queue pouring out the door every time I've gone past, but the queue moves quickly, so don't let that put you off! Over a couple of visits I've now worked my way through the majority of the menu. The Chik'n Tiki Sandwich, with hot sauce, buttermilk mayo, pineapple, bacon and cheese is amazing. It's all the things a chicken burger should be - so juicy and zingy, with good crunch and all held together by a burger that stands up to its contents. Then there are the burger options with some or various of the components of the Tiki, plus extras, my favourite being the Chik'n Hot - Sriracha sour cream, lettuce and spicy slaw. Nife is Life got in touch with me recently and asked if they could send me some produce from their online Italian deli. After a quick peruse of their site I was keen to try out some of their goodies so when a big box of meats, cheeses, fresh Italian tomatoes and other delicacies arrived the next day I got stuck straight in. Large bag of spinach leaves - I used the long leaf spinach from mum's garden but any spinach will do! Put all the ingredients in a blender and whizz together. Taste and add more pecorino and pepper as needed, and add enough oil so that you get a good pesto like consistency. When it's to your liking pop into a jar, add a layer of oil and it will keep for a week or so in the fridge. For the pasta, I cooked up some penne, stirred it in with the pesto and a bit of the cooking water, then topped it with torn up, creamy as you get burrata. I'm pretty spoilt when it comes to eating out. I get invited to review lots of lovely, and some not so lovely places, and I book myself in to the newest openings to check them out as soon as I can get into them. So, it takes a lot to impress me. There are restaurants I like and appreciate and am glad I've been to but probably wouldn't go to again, and then there are places like Westerns Laundry, where before I've even left on my first visit I'm plotting my next one and lamenting the fact that it's not in West London where I live. Westerns Laundry also snuck up on me. I hadn't heard of it, I hadn't heard anything about it until I read Grace Dent's review of it in ES Magazine two weeks ago. I booked a table for the first evening that Lucy and I were free and headed there last night for a feast of epic proportions. The only problem we really had being what to choose from the menu! 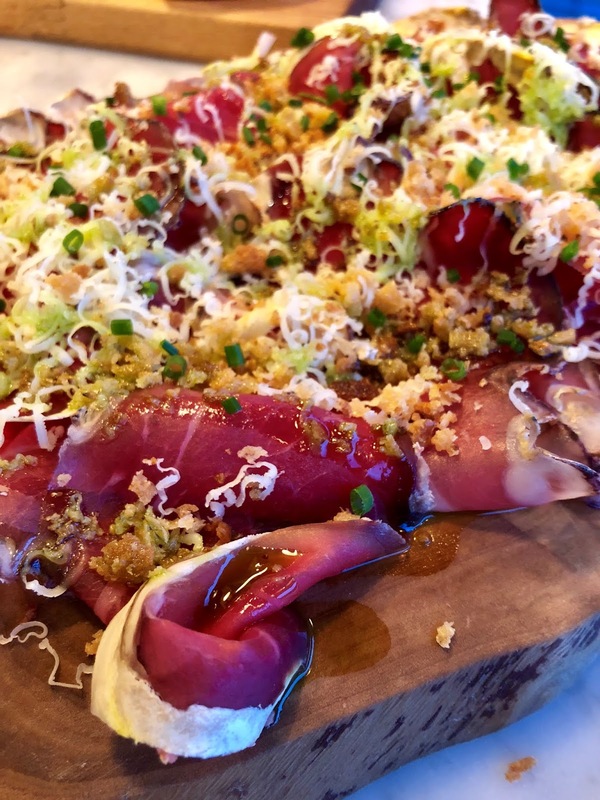 The menu changes daily and features sharing plates of seasonal goodies - lots of shellfish, but also delicate fish dishes and more hearty meat ones. We gave it a pretty good go! Summer seems to be finally eeking its way to London and what better way to celebrate than with a Bacchanalian feast. According to Google Bacchanalian means characterized or given to drunken revelry which seems an apt way to celebrate this heatwave/the summer. So The Dead Dolls House on Upper Street are putting on a Bacchanalian Feast every first Thursday of the month. And drunken revelry or not, it's definitely worth a visit for the food alone. The venue is beautiful too - black and white chevron tablecloths made stunning by the simple yet plentiful strings of fairy lights.